"Adams' performance culminated in an encore that left you gasping for more." "Adams presented not just the brilliance of Elgar, he gave of himself - raw emotion and highly charged excitement - and covered himself in glory." Peter began his musical studies whilst at school with Dennis Nesbitt and Maurice Zimbler. At the age of 16 he joined the orchestra of London Festival Ballet and in 1984 was made principal cellist with the London String Orchestra and London City Ballet. In the same year he was appointed professor of viola da gamba and baroque cello at the Royal Academy of Music where, at 21, he was the youngest ever professor at the RAM. In 1988 Peter left England to study for two years at Indiana University, USA, where he took lessons and masterclasses with Tsuyoshi Tsutsumi, Janos Starker, Paul Tortelier and Rostislav Dubinsky. Upon returning to England He undertook a period of study with William Pleeth. He was a founder member of the Rogeri Trio and is currently a member of the Bochmann String Quartet, both with a large list of recordings and broadcasts. Peter appears as guest principal cellist with a variety of orchestras all over Britain and is the principal cellist of the English String Orchestra, Brighton Philharmonic, Oxford Philomusica and the City of Oxford Orchestra. Peter's interest in the viola continues with solo appearances on viola da gamba and as the director of the Elizabethan Consort of Violas. 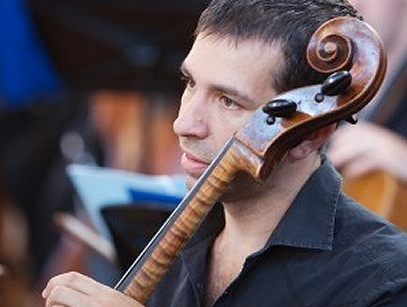 He is greatly sought after as a teacher both of the cello and as a chamber music coach giving masterclasses, adjudicating and judging a wide variety of students and young professionals across the country. He is currently teaching cello for Oxford University and for Oundle School. Peter plays a cello by G. B. Rogeri dated 1697. Soloists: Peter Fisher and Maya Iwabuchi, violins, and Peter Adams, cello.